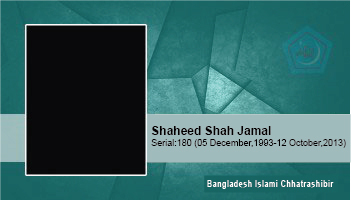 On October 9, 2013, Jamal participated in protests of Islami Chhatra Shibir. At that time he was seriously injured. Jamal was rushed to Islamia General Hospital. From there, he was taken to Islami Bank Central Hospital at around 2pm. Later, he was treated in the Elephant Road General Hospital. Three days after being in ICU, Jamal attained martyrdom at 9 o'clock in the morning on 12 October.